You're living in the lap of luxury with a beautiful man that showers you with diamonds, roses and jeweled accessories. Click here to play! It's the perfect life except for one thing. The evil Celeste is trying to get her greedy hands on your man and your riches. Round up all of your jewels before she does! Of course you're going to want to get all of the white diamonds as you can. Five of these gems pay out 3000 times your original line wager. And what's life without the man who showers you with presents? If you're lucky enough to spin two to five handsome cads you can win up to 2000 times your wager. Watch out for Celeste; she's there as well. If you can spin five of her, you'll get 1000 times your bet. You'll also need to collect your other accessories, such as jeweled purses, roses, blue diamonds and rings in order to collect as much money as you can and beat Celeste at her own game! The more white and blue diamonds you collect as they act as scatters and substitutes to help you create the most possible winning combinations. Start working your magic now to collect all of the jewels before Celeste has the chance to weasel her way into your spotlight. 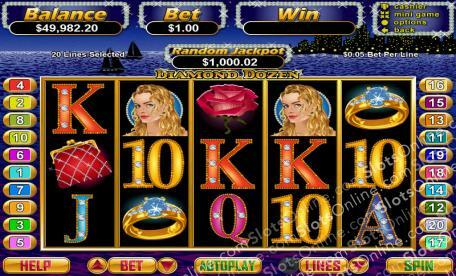 Two or more Blue Diamonds anywhere on the board will multiply your total bet respectively. Shimmering white diamonds will substitue for all other symbols excluding scatters. Five of these babies will pay out 3000 times your original line bet. The Diamond Delight feature is triggered with three or more White Diamonds anywhere on the board. It is a 'pick a box' style game that multiplies three numbers plus your triggering bet, which will be your total prize.